I'm riding the Chinatown Bus up to New York City for the third time in the past eight months. I would actually consider this one of my more successful trips, because we didn't change routes and drive to the Eastern shore, and nobody's luggage has been stolen. Not yet, anyway. There has, however, been a yelling match between one of the passengers and the bus driver... but let's be honest, that's only to be expected. Anyway, I'm just excited that there's internet available on this bus. Gee golly willikers, what'll they think of next!? I'm not quite sure how it works, but I'm going to assume that it involves either black magic or Rebel from Heroes. UPDATE: Our bus just got heckled by an SUV full of high school girls. I don't know what's happening in my life anymore. Dwight, James, Katie, and I went hiking today at Crabtree Falls. The weather gods smiled upon us and held back the rain in spite of the 80% chance of precipitation forecast. Take that, weather.com! 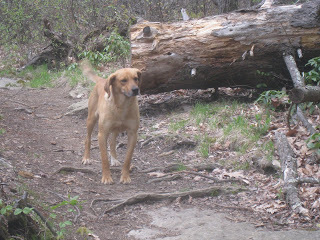 During the hike, we met a dog with no collar or tags that will henceforth be referred to as Spirit of the Mountain. 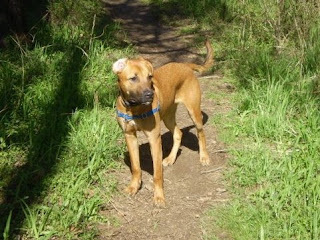 Spirit would randomly appear in front of us during the hike, run around with Titan for a few minutes, and then disappear again. He would appear again out of nowhere, without fail, in a matter of minutes. It was like Spirit was guiding us to our destination, not that we needed it on the extremely well-blazed and well-maintained path. Still, it was nice to know that the mountain was looking out for us. On the drive home, we stopped and got ice cream from a local shop. And that's how we gained back the 2000 calories that we burned during the hike. My mind has officially shut down. I went to the U-Singers Banquet this afternoon to celebrate the end of the year with them as the cool/creepy alum, and I purposely ate there so that I wouldn't have to cook dinner tonight. Then I came home, talked to Nosheen for awhile, realized it was pretty late, and decided to make some shrimp stir-fry. It wasn't until I had finished the entire bowl and decided to move on to some leftover Qdoba chips I had in the fridge when I remembered that I had, in fact, already eaten dinner. What is wrong with me?? Foxfields has come and gone. I would have posted about it earlier, but I literally spent the entirety of yesterday recovering from what transpired. There was drinking, there were horses, and there was more drinking. I spent the majority of my time at the Med School plot, since Nosheen and I were in charge of the event this year. And there was really no reason to leave: we had Raising Cane's chicken tenders, Subway sandwiches, a DeWalt boombox, and shade from our glorious canopies. I legitimately do not know what I would have done without those tents, because I would certainly have had a heat stroke and died. All in all, it was a pretty solid weekend and a great end to M1. Here's to a new school year and a new layout to go with it! Tomorrow is Foxfields. Nothing can prepare me for what I am about to experience. God, I love UVA. As of today, I am a second year medical student. Well, pending the release of my final exam grades, of course. I can't believe that I'm a fourth of the way to being a real, live doctor! I am the greatest! RAWR!! Titan just ate a bug. I have trained him well. Second of all, a new roommate Stephen just moved in. Here's to new adventures! Third of all, and most importantly, both I Watch Stuff and Catherine have brought to my attention today that the folks over at Warner Brothers have released a third trailer for Harry Potter and the Half-Blood Prince. Sit back, relax, and enjoy. Rohan and I bailed from the library tonight to go hang out with Stevie and Jim. I know, I shouldn't have, but I just couldn't help myself. And I obviously made the right decision, because Jim had a plethora of stories to tell us. The most memorable one being about his friend Ryan, who got married today. 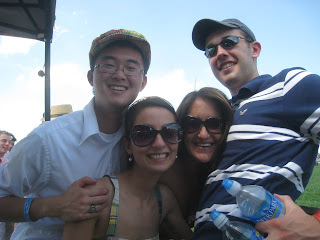 Ryan is a fifth year finishing up his Master of Education degree. He is currently student teaching a class of second graders. One of the boys in his class is named K'knowledge (pronounced "kuh-knowledge"). No joke. Even better: one of the girls in his class is named L-A (pronounced "la-DASH-a"). Seriously? SERIOUSLY!? I can't believe I used to make fun of my friend Hy for being named Hydrogen. This is a whole new ballgame, guys. I'm totally naming my kid S& (that's pronounced "Sampersand," duh). For better or for worse, I am done with Physiology. The exam took an epic 3 1/2 hours for me to complete, but at least it's all over with. Here's to hoping that I passed and don't have to take another Physiology test for the rest of my life. That's the good news; the bad news is that it's Saturday, it's 75 degrees and sunny, Jim is in town... and I have to stay in and study for my upcoming Human Behavior and Neuroscience exams. 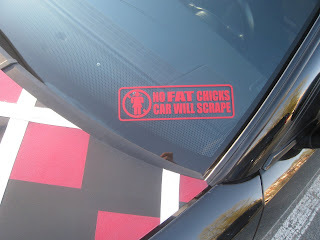 The only thing that made me crack a smile today was this sticker that I saw on a car parked in front of Student Health that said, "No Fat Chicks: Car Will Scrape." Haha, fat jokes are always funny! 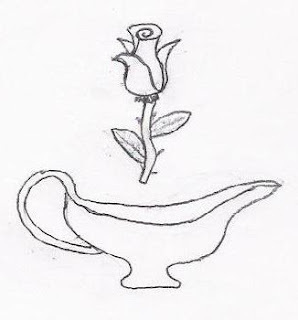 This is a drawing I just received in my e-mail inbox from John, under the subject "I changed my mind." John, I commend you for your excellent time management as well as your talented use of what appears to be MS Paint. May you be a source of inspiration to all of us as we struggle to learn Respiratory Mechanics. On an unrelated note, I'd like to congratulate Josh on his first Asian buffet meal. A bunch of us went to China King Buffet after our last class of first year today (sniffle), and it was, in a word, magnificent. We came, we saw, we devoured. My food baby lasted for a good three hours, and my post-prandial nap threatened to do the same. FML. - Does that book say "Brotastic" on it? No, wait, it says "Biostatistics." - I wonder if the myth of Hercules is based on a real person. - Hmm. I haven't showered in over 32 hours. - When is the Wolverine movie coming out? - The roof of my mouth hurts. - I hope Titan hasn't found another way to escape from our yard. - I wish it would thunderstorm. 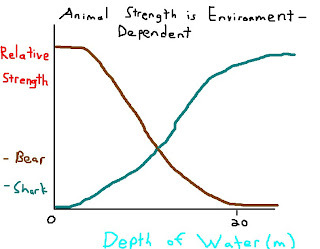 - Which animal is more powerful: a bear or a shark? Today's neuro lecture was given by a doctor who, I swear, looked 28 years old. Then she told us that she was born in the late '50s, graduated in '87, and had two teenage daughters. Shocking. Anyway, she told us that back when she was a child (in the '60s! ), pregnancy tests were done by injecting rabbits with women's urine. If the patient was pregnant, the rabbit's antibodies would react with the hCG hormone in the specimen, leading to the furry animal's untimely death. Well, according to Snopes.com, this story is a lie that was perpetuated by movies and TV shows at the time. I can't believe she lied to us! As John so eloquently put it, if I weren't in love with that woman, I'd be pissed. Also, check out this clip from Britain's Got Talent. It will warm your heart and perhaps even bring you to shed a tear. But not me. Because I'm brawnier than the Brawny Man. I went grocery shopping yesterday but managed to forget half of the things I needed to buy, so I had to go back to Harris Teeter today. I ended up seeing everyone while I was there: Nosheen, Sunny, and Neil as I was walking in; Kelly from the music department as I was shopping; and Lauren as I was checking out. Which sets me up perfectly for the following story. Just as I was walking towards the cash registers, I heard a series of shrieks coming from the front of the store. Curious, I walked over, and I found Lauren and her parents waiting in line. Lauren told me that some guy had been walking around the store with his pet snake wrapped around his neck. Apparently one of the cashiers saw the snake and started screaming, which set off a chain reaction amongst the store employees. Ah, the crazies of Charlottesville. May you never be farther than a stone's throw from me at all times. I just got back from the Easter Sunday service at University Baptist Church. As always, Pastor Leland gave a challenging yet inspirational sermon, and today's was on what it means to be "Easter People." The service was really nice, and it was nice to see so many people in church, but there was one thing missing: we didn't sing my favorite hymn, Up from the Grave He Arose. For those of you who don't know the song, its verses are very slow and somber, but the chorus sounds extremely gallant and triumphant. It's like the song has bipolar disorder... and I love it. The song became even cooler after after Caroline told me about her friend, who thought the words sounded a lot like the phrase "Up from the gravy, a rose!" and made a drawing of it that I tried to replicate on the left. Hmm. On second thought, maybe I oughtta stick to playing the piano. And now, to celebrate this beautiful Easter afternoon by studying hepatic histology. Why? Because if one organ could resurrect itself from the dead, I'm pretty sure that it would be the liver. I went house-hunting with Joseph and Jordan this morning. 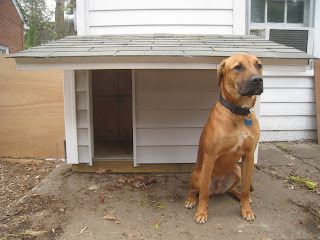 We drove all the way out to Ruckersville to pick up a doghouse for Titan so that he would have shelter in the backyard. It's actually really nice... it has vinyl siding, shingle roofing, plywood flooring, and it's even double-insulated. In other words, it's better constructed than the house that I live in. Anyway, now I won't feel guilty if I have put him outside while I'm at school. More importantly, I can leave him home alone without him whining when he's crated or destroying things when he's not crated. Everybody wins! Everybody except for my chapstick, which I accidentally put through the washer/dryer today. Now my chapstick is destroyed, all of my clothes have weird smear-marks on them, and I have to do my laundry over again. Man, Saturdays are awesome! Waking up so early does come with its price, though. After lunch, I tried to study the histology of the male reproductive system, but within minutes, I felt the onset of an inevitable postprandial nap. I laid down in one of the comfy couches in the quiet area of the library and proceeded to sleep for AN HOUR AND A HALF. My life is absurd. During my nap, I dreamt that I was sitting at a desk at the library trying to study, but instead all I could do was surf the web for new Lolcats and FAIL Blog posts. How is it that I have lost all motivation, not only in my real life, but even in my dreams?? So I think I finally came to the decision that I didn't really enjoy Watchmen after all. The story just didn't do it for me... and apparently it didn't do it for this guy either, who shot himself in the theater halfway through the movie. I should probably show some sensitivity here, but let's be honest: your movie has to be pretty bad if a man decides to shoot himself while watching it. I recently decided that Titan needed a middle name. I got this idea the other day when I heard another dog owner yell a three-part name at the dog park in order to get his pet's attention. "That's so cool!" I thought. "I want to do that too!" After agonizing over it for an entire day, I decided upon the name "Nicholas." This is, of course, to honor my totes bffaeaeae Catherine Nicholas, who was there when I adopted Titan, as well as my roommate Nick, who helps take care of Titan while I'm at school. Talk about two birds with one stone! Speaking of the dog park, I saw a dog there yesterday who looked exactly like Titan. In fact, their body size, physique, color, and face all looked so much alike that when they were running together, I couldn't tell the two of them apart. It also didn't help that they were even wearing the same blue Easy Walk harness. The only thing different between them was their eye color; Titan's are a dark brown, and the Charlie's were yellow. I asked Charlie's owner if he knew what kind of dog Charlie was, hoping it would shed some light on what kind of dog Titan was, too. Unfortunately, he had no idea, either. I guess I'll find out when I'm willing to shell out the money to get Titan's DNA tested... which will be... never. For a long time, I was friending all of the Sam Zhaos I could find on Facebook. I'm not really sure why, but I guess I thought it would be fun for some reason. Some of them accepted my friend requests, some of them denied them, and worst of all, some of them left me in limbo. As a result, every time I search for "Sam Zhao," a few show up having the dreaded "Friend Requested" phrase in gray text next to their name. I was surprised to find that a few of them wanted to know more about me. Several of them sent me messages asking me about my life and what I did and why I friended them (I thought that part was pretty clear), and I actually corresponded with several of them. Most of the ones I talked to lived in either China (shocking) or Australia, where apparently there are a ton of Chinese immigrants. Anyway, I took the leap last week and defriended all of them. This was in part because I was beginning to feel weird and creepy friending high schoolers that I had never met before, but it was mostly because I wanted to tag videos of myself on Facebook, but when I typed in my name, it would only give me five options, and none of them would be me. What's wrong with you, Facebook? Why are you trying to get in the way of my narcissism?? And thus ends one of the most epically unproductive days of my life. It began with a Jubilate Alumni Association Meeting, segued into a 10-mile hiking trip with Jon, Ellen, and Titan, morphed into ice cream from Splendora, and ended with a cookout at the 520 house. After eating a delicious hot dog and four scrumptious (that's right, I said "scrumptious") kebab sticks, I finally came home to do some work. Within ten minutes, I received a Gchat from Matt asking if I wanted to go see I Love You, Man. An hour later, I found myself driving to the movie theater with Josh, Matt, and Sean. Why, why do I have no self control?? I swear, I'm actually going to get work done tomorrow. Maybe. I just took the Medical Specialty Aptitude Test that Anjie sent out to our class. It involved answering 130 (very repetitive) questions about my personality, and at the end, the results showed that I should go into either Emergency Medicine, Ophthalmology, or Radiation Oncology. I am pretty surprised at the results, since I have never considered any of those fields as possibilities. I still haven't even figured out how to properly use the ophthalmoscope, which I think might come in handy when I'm inspecting a patient's eye. Meanwhile, Family Medicine and Psychiatry, the two fields I'm most interested in right now, came in at #14 and #32, respectively. Maybe I should give up my dream to be a doctor and instead pursue a career as a flight attendant. Why? Because this is the coolest guy ever, and I want to grow up to be just like him. Sam: So tell me about your anxiety. Have you had any trouble with it lately? Patient: Well, not really, although I guess the economy has been causing me some stress. You know, I have to pay $497 a month for my COBRA. Sam: [thinking that he was talking about a Ford Mustang Cobra] Wow, that's pretty steep! Is that a recent purchase? Patient: [looking confused] Well, I had to start paying for my own insurance after I had to leave my job due to my health. Sam: [realizing that he was actually referring to the Consolidation Omnibus Budget Reconciliation Act] Oh, I'm so sorry... I thought you were talking about the car... I guess you know where my mind usually is! Dr. Gazewood: Do you ever have headaches with that? Patient: No, I don't. I've never had a headache in my life, I don't reckon. Patient: But I sure have had a hangover! HAHA!